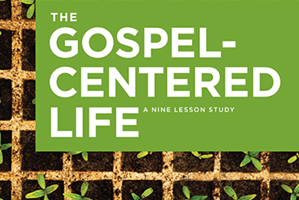 My small group just began the 9-week study "The Gospel-Centered Life" by World Harvest Mission. I've gone through the 36 week version of this study (Gospel Transformation) twice, once as a learner and once as the teacher. I've also taught another small version of it called "Living in Light of the Gospel Story." These are some of my favorite studies, as well as some of the best reformed explanations of the gospel I’ve ever encountered without ignoring one great aspect of the person: the heart. All too often, reformed theology shoots for the head and forgets that we are holistic people. These studies balance both in a great way. There were some tears during the first lesson, as one group member was recounting a painful experience she had in the church many years ago that has since stunted her growth in the Lord. When I asked her if she’s had the chance to really grieve it, she said she said. She said many many tears were shed over the experience.